Who doesn’t love a cup of creamy, fluffy latte? I mean, there probably are some people who don’t, but I’m not one of them. And if you are anything like me, you probably want your lattes every day. Which means, you absolutely have to learn how to make this delicious beverage at home. Good news! Today, I will share two different methods with you. You can become your own barista and make lattes at home any time you want. Let’s start! This method is cheap simply because it doesn’t require any special equipment. But don’t think that your homemade latte will taste bad and, well, cheap. No-no! If you use proper beans and follow this step-by-step guide, you will end up with a cup full of heavenly creaminess, with a pinch of bitterness from the coffee. Let’s get to brewing, and enjoy! a French press or a stovetop Moka pot (optional). First, you need to brew your coffee. If you have a French press or a Moka pot, excellent! You will get a cup of strong, full-bodied coffee. However, if you don’t have them, there are other ways to brew coffee. The simplest (and, again, the cheapest) one is to brew it directly in your cup. Put 2-3 teaspoons of ground coffee into a mug and pour some hot water on top. 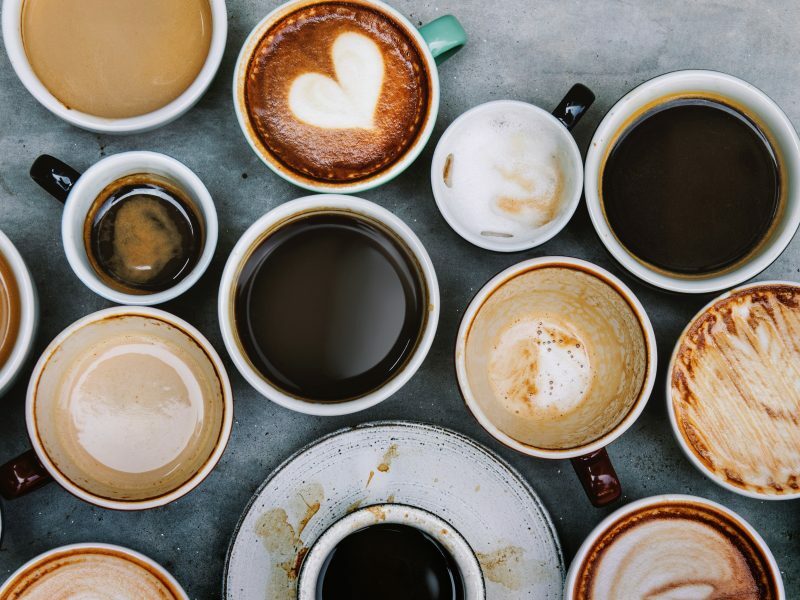 The recommended ratio is 1 part coffee and 2 parts water, but feel free to experiment to find that perfect combo for your desired beverage strength. Leave your coffee to brew. 3-4 minutes would be enough. To kind of mimic the French press brewing process, you can cover your mug with a small plate and let the coffee steep. Keep in mind that you will transfer your beverage from this mug to another one. Now, grab the second mug. This one will also be your serving cup. Place a sweetener of your choice on the bottom (if you use any), then pour your brewed coffee using a fine sieve to catch the grounds. You don’t want any bits in your homemade latte, do you? Stir the beverage to combine coffee with your sweetener (if you’ve added any). The next step of this homemade latte recipe is making the milk foam. Pour the milk of your choice into a jar and close it tightly with a lid. Then, shake the jar really hard for around 30-60 seconds. You don’t need to do this for too long because we are not trying to achieve the micro foam here (it’s more possible with a special steam wand, not a simple jar). Once you notice that large, fluffy foam appearing, you can stop. Unscrew the lid and place your jar in the microwave. Heat it up for around 30 seconds. Don’t worry, the foam will stay. Additionally, your coffee won’t get cold since you will be adding warm milk. Using a spoon, hold the foam in the jar while pouring warm milk over your brewed coffee. Once you have enough, start transferring the foam. The most gentle way is to do it using that same spoon. Simply add the foam spoon by spoon until your mug is filled with those creamy, fluffy clouds. And voila! You have your delicious homemade latte. Enjoy! There are two main ingredients that make a good cup of latte: a fresh espresso with a good amount of crema and a bold flavor, plus a nicely textured and steamed milk. 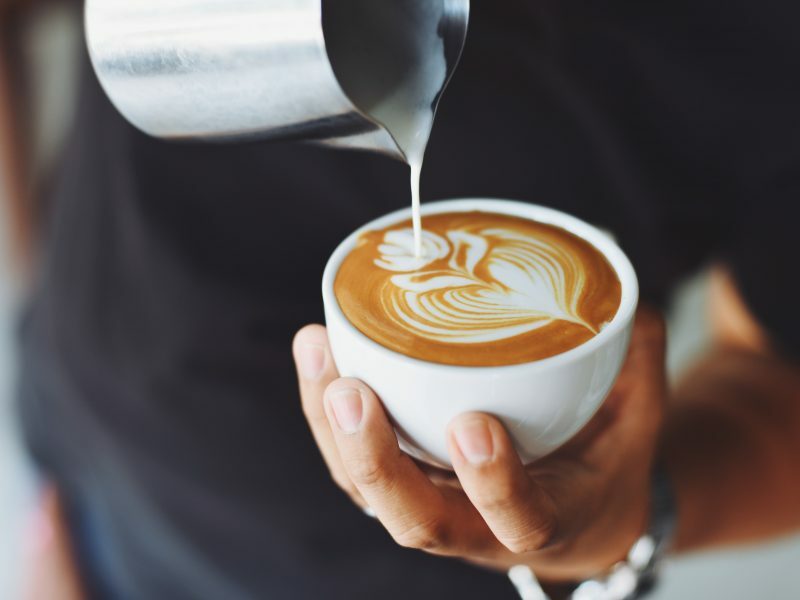 If you need to sweeten your beverage when making lattes at home, make sure that you add your sweetener before you add the foam. You see, you will need to stir the beverage to combine the sweetener with coffee. And when there’s foam, stirring will destroy it. Homemade latte recipes oftentimes involve coffee art. However, because you are going to transfer the foam using a spoon, it may be hard for you to “draw” something. However, what you can do is use special coffee stencils and cocoa. It’s very simple: you place the stencil above your mug and sprinkle some cocoa powder over the foam. The stencil will create a little picture, which only means more enjoyment added to your coffee drinking ritual. The common ratio of coffee and milk for a latte is 1 part coffee and 3 parts milk. However, you are free to experiment. Additionally, the amount of milk can also depend on the strength of your coffee. If you brew really bold beverages, you might want to use more milk to reach that sweet, creamy latte flavor and texture. Often, different ways to make lattes at home involve flavoring your beverage. This is when you can really let your imagination fly. Latte tastes great with different syrups, spices (like cinnamon, vanilla, cardamom, etc. ), flavored powders, and so on. You can even make a Pumpkin Spice latte by adding some pumpkin puree, cinnamon, and a pinch of nutmeg to your beverage. When “frothing” your milk using a jar, you need to remember that not all milk types foam equally well. The best foam is made using whole milk. For vegan options, soy and oat milk would be okay. As for the almond milk, it might take you too much effort to foam it. To brew latte, you first need to brew espresso, of course. Put your finely ground coffee into the portafilter. Level the grounds and tamp the coffee. Put the portafilter back (reattach to the machine), place your mug under the dispenser, and press the brewing button. Now that you have your rich, flavorful espresso, it’s time to steam the milk. Fill the pitcher with cold milk (it’s best to put it in the fridge beforehand if, for instance, you have just bought it). Place the pitcher under the steam wand. Make sure that the wand’s tip is near the surface of the milk. Activate the steam wand and aerate your milk for around 3 seconds. Because, in the majority of cases, steam wands in coffee machines are quite powerful, the frothing process will not take much time at all. Submerge the steam wand into the milk toward the bottom of the pitcher. Heat the milk to around 150 F. You can use a thermometer or, if you don’t have one, try to touch the side of the pitcher with your finger. If you can’t hold for more than a second, your milk is hot enough. Tap the pitcher on the counter a couple of times and then swirl it gently. This will get rid of any large bubbles, keeping your foam fine, fluffy, and with a dense texture. Now it’s time to pour your milk into the coffee. Start by holding the pitcher rather high and tilt your coffee cup. Make sure that the stream of milk is thin. Pour it into the center of your espresso. When your mug is half full, lower the pitcher closer to the surface of your beverage (just above it). Fill the cup until the white circle of foam appears. Here’s when you can play with some foam art a bit. You can create a simple heart by moving the pitcher across the foam circle. Or, if you are feeling extra fancy, you can use toothpicks to draw something more interesting. And, of course, enjoy your beverage! You can also make iced latte at home. To do that, place some ice cubes into a tall glass or mug, then pour your espresso onto them, and then add milk and foam. It’s a perfect beverage for warm summer days when you need your caffeine fix but want something cooling. For the best foam texture, use cold milk. Additionally, you can keep your pitcher in the fridge as well. This way, steaming and foaming will result in a dense, fluffy, stable foam (yum!). If you are a vegan and need a plant-based milk, I recommend the soy one. In my experience, it’s the best for foaming and frothing. Some pre-packaged almond milk brands are also pretty good, but they aren’t always 100% natural. 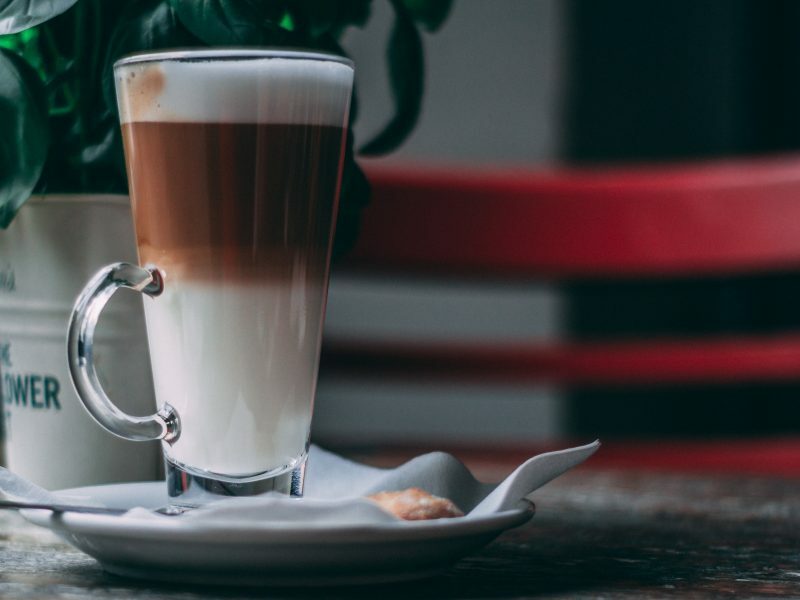 Oat milk tends to create a nice foam when steamed, but it has a rather watery taste, which means your latte will not be that creamy and flavorful. To enhance the flavor of your coffee, add a pinch of salt to it. You will not actually taste the salt, but the coffee body will become more noticeable. If you want a beautiful looking beverage (and are even thinking of trying some latte art), keep in mind that contrast is your way to succeed. You see, the dark crema of the coffee is the best canvas for your “milk paints”. Therefore, when starting to pour the milk, be gentle. Make sure the stream is thin and goes right through the cream without distorting it. When using an espresso machine, make sure your portafilter is warm for the most flavorful espresso. Some models have a pre-heat function, which is very helpful in this case. However, if your machine doesn’t have such a feature, you can simply run your portafilter under the hot water. Easy peasy! Investing in a thermometer is a good idea if you want your milk foam to be perfect every time. The proper temperature should not be higher than 160 F (while 150-155 degrees are considered to be an optimal number). Moving on to the steam wand. To avoid water getting into your milk, purge the wand before steaming. Just hold an empty cup or a container under it and turn the steam on for a couple of seconds. Then you can proceed to steam your milk. In the majority of cases, steam wands have small air intakes. They can get clogged with dried milk, which can influence their performance and the quality of your foam. Therefore, it is important to regularly take your wand apart and clean it thoroughly. Many people also love making cafe au lait at home. It might remind you of a latte, but it doesn’t have that fluffy foam. Basically, cafe au lait is simply regular coffee mixed with milk. It’s delicious, but it’s just not a latte. So, don’t confuse these two beverages when making them at home. If you brew your coffee using a French press (or your mug), grind it coarsely. This way, you will ensure that none of those coffee bits gets into your beverage. Because the grounds will be quite large, they will be stopped from getting into your cup by a French press filter (or a sieve, if you are brewing in a mug). Always keep your equipment clean. This rule is obvious, but many people still forget about it. And they end up with a weirdly tasting cup of coffee. If you don’t have a coffee machine, try the cold brew method. It involves pouring some room-temperature water over your grounds and letting the mixture steep overnight. What do you get? A bold, strong, rich beverage, which you should probably dilute with water a bit before drinking (or mixing with milk). Invest in kitchen scales. This will allow you to find the perfect ratio for your favorite beverage and be precise every time when making it. Know your flavors. Do you like fruity coffee that smells a bit like berries? Or do you prefer coffee beans with a hint of chocolate? Each coffee bean type and origin results in a specific set of flavors. To get a perfect cup of latte every time, you need to figure out which flavors you prefer. Try to find a local roaster to always get fresh beans. Also, don’t be shy to ask questions. In the majority of cases, roasters are very passionate about coffee. So, if you show interest, they will only be pleased (and ready to share their knowledge with you). Using tap water. You might not notice it at first, but tap water changes the way your beverages taste (the same rule applies to teas, smoothies, etc.). It’s better to brew coffee using bottled or filtered water. Using dirty equipment. Again, this will definitely change the way your latte tastes. Using old beans (or buying pre-ground coffee). Only fresh beans can offer you that rich, pure, bold flavor. Pre-ground coffee or old beans aren’t even worth brewing, in my humble opinion. if you don’t have a grinder at home, you can ask for your fresh beans to be ground at your local coffee shop or roaster. Neglecting the coffee to water ratio. Making lattes isn’t a science, but you need to be precise. Only this way you will know how much coffee and water you need exactly to brew that perfect beverage. Trying to save money on your beans. When it comes to coffee, cheap never means good. Of course, there are many ways to mess up your beverage, but these are the most widespread. Stay clear of them, and chances are your lattes will taste just as good as at your favorite coffee shop. If you prefer taking your latte with a sweetener, you can try making a syrup yourself. You will only need sugar and water, plus some spices or flavorings. This will help you save some money on the sweetener. Additionally, you will be able to make pretty much any flavor you want and experiment with your favorite spices. If you are a huge latte lover like me, you probably want to drink it every day. And while going to coffee shops is quite expensive, you now know how to make lattes at home. However, if you are going to do that regularly, you might want to invest in some equipment that can make the process easier (and make your life better). For instance, a good French press or a stovetop Moka pot would be a great way to brew coffee at home. They offer rich, delicious beverages and don’t require too much effort from you. Additionally, they aren’t that expensive. Investing in an AeroPress is also a good idea. This little machine can make great espressos, which are a base for a delicious latte. Another thing that might come in handy is a milk frother. A simple semi-automatic model (which kind of looks like it has a small whisk on its end) would not cost that much. But it can definitely help you create that dense, fluffy foam. So, are you ready to make your favorite beverage at home? Which latte brewing method are you going to try? Let us know in the comments below!